If you are the adventurous type, you won’t be let down! There are plenty activities for you around the Tree House! Puerto Viejo is famous for its surfing, but watch out for some of those waves. Salsa Brava is well known for causing a lot of accidents. We recommend extreme caution at this beach. There is a strong and dangerous wave that breaks over a coral reef with an amazing drop. This is the most powerful wave in Costa Rica. This wave has earned itself the name of Salsa Brava, angry salsa. Many broken boards lie in its wake, so we recommend you to bring more than one, soyou can enjoy the truly large waves. Playa Grande is easier to surf, just 1 km south of Puerto Viejo. You can expect big waves, without dangerous reefs. For swimming, Playa Grande is not recommended. It has a strong riptide and several people drown each year. Lifeguards control the beach everyday and do go out swimming when the red flag is out. For safe swimming you can go to Punta Uva and Manzanillo beach. On a scale of 1 to 10, white water rafting gets 11. The trip is well worth it: it includes breakfast and lunch, transportation from Puerto Viejo to San Jose, or the other way around, the staff service and expertise, and of course, the river. 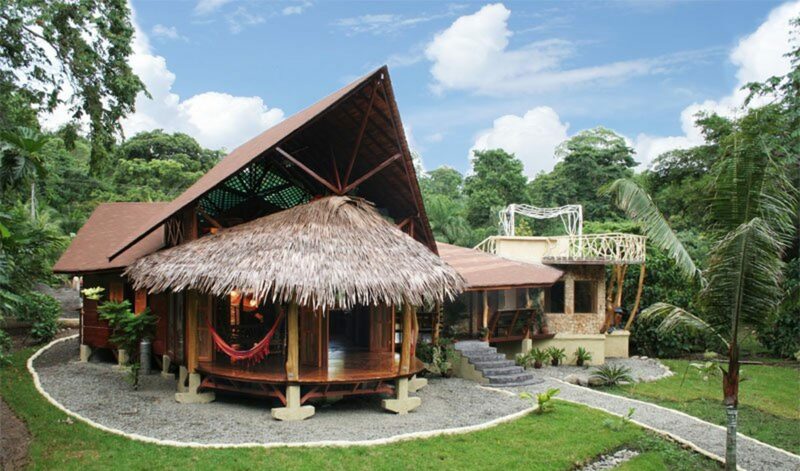 All of this will make your day an unforgettable experience in Costa Rica. For a variety of reasons the Pacuare River is one of the best choices for your adventure treks in Costa Rica. The Pacuare river is world famous for its sheer beauty. Here, you will enjoy the feeling of total isolation from urban life and the realness of being connected with nature. You see waterfalls cascade into the river from both sides, colourful,tropical birds fly right over your head. Amazing views of a virgin tropical rainforest appear before your eyes as you descend this true exploratory land. The Canopy Tour in Puerto Viejo is a great fun tour for the whole family. The Zip Lines and the platforms allow you to enjoy the Caribbean Rain Forest from high Jungle Canopy, while enjoying the thrill and excitement of a real forest adventure. When you make tour reservations or arrangements thru the Tree House Lodge, you contribute with the Green Iguana Foundation, dedicated to the preservation of the Green Iguana, an specie in danger of extinction. And you get a free Iguana Conservation Tour, given every week on Tuesday, Thursday and Saturday. Stay 2 nights or more during May and June and receive a 20% Discount on your visit! Take advantage of this sweet deal on our Booking Page! Or click on the sloth! ¡Quédate 2 noches o más durante mayo y junio y recibe un 20% de descuento en tu visita! ¡Aprovecha esta dulce oferta en nuestra página de reservas! O haz clic en el perezoso.